Sitting at the edge the edge of the gulf of I stare across the open water toward the dancing lights of the towers of Doha. The wind blows at a perfect pace. Not enough to bring on a chill but just enough to keep my hands from overheating if I alternate the fingers that hold my steaming cup of karak tea. In this moment I am forced out of myself, to appreciate the beauty of the place and moment in which I find myself. The people around me are somehow at once irrelevant to this moment and irreplaceable in its construction. For a few minutes the world submits to my tiniest preferences and created my perfect night-in February. Most travel magazines feature glossy images of place just like this, as do travel blogs and specials on TV. To many, I am experiencing the height of travel. Sitting in a beautiful place that only locals know about, relying on the knowledge of local Qataris to extract the countries best sights, sounds, smells, food, insights, stories and perfect nights like this. I have been told by my culture that travel is about me. It’s about hopping on a plane and traveling thousands of miles away from my home and my stresses and my problems, to be taken into the arms of the world and allowed to indulge in the unleashing of the part of me that craves freedom and adventure. To the degree that I can escape my problems and pursue my sense of whimsy, I have succeeded in the common man’s definition of what it means to be a great traveler. The great paradox of modern travel is that it exists in a cultural climate of maximum extraction. We seek to absorb the best of our destinations, demanding the country’s best beaches, most flavorful dishes, and museums in which the country’s history prostrates itself naked before our eyes. We demand excitement, wonder, peace, depth, risk, mystery, beauty, and most troubling of all, authenticity. The trouble with these demands is that they all take place in the vacuum of our own indulgent adventurescapes, where the entire country exists just for us. We expect to become children when we travel. We expect that somehow we can be stimulated, cared for, and educated-all in exchange for nothing. We impress our own needs and goals onto our destinations without considering that perhaps they too have needs and goals. Perhaps they too have dreams to chase and problems to flee. The issue with us as travelers is that we are firmly planted in a cultural climate that endorses the idea that it is perfectly normal to demand the best of our destinations, without sharing the best of ourselves. 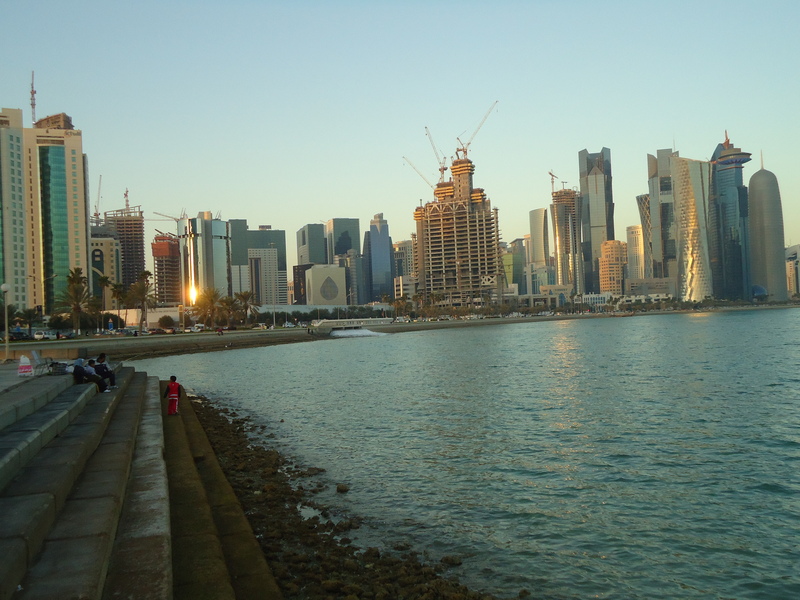 Coming to Doha had reminded me of what real travel is about – reciprocity. I have aggressively demanded an authentic experience from Doha. I have made friends with its people, and gone to some of its private and most intimate places. I have seen its best and its worst. But I have also tried whenever possible to be as authentic with Doha, as Doha has been with me. And in pursuing a relationship supported by a keystone of mutual authenticity, Doha and I are constantly able to show the most beautiful sides of ourselves to each other. Many of us travel to escape tragedy or pain or hopelessness. It’s understandable. We fool ourselves into thinking that these things can’t hop into our cars or onto our planes and follow us, and perhaps we are correct in this regard. But tragedy and injustice are like birds. You don’t have to take them with you, but wherever you go in the world, you will find them, just singing a slightly different song. Nevertheless, we often choose to avert our gaze from the darker sides of places we go, because we only go there to forget the darkness that resides within us. We want to believe in places where the air is so clean and the water is so clear that it can cleanse are souls and spare us the hard work. Interacting with the migrant workers of Doha demands that I bring the darkness of my past with me. Like many systems in the world, Doha has been structured so that these workers and people like me never see each other. To them I am supposed to be sir and to me they are supposed to be nameless. I am to count on them to cook my meals, keep order in the places I live and study, and keep watch while I sleep, but to remain invisible while doing it. And the sad part is, I can see how that might be the easy thing to do if my notions of travel came from a leisure magazine. Not so long ago, my grandfather worked as an engineer, calling people sir. It didn’t matter if these people had more experience than him, or even if they had degrees comparable to his own, they were still sirs. I personally hate the word sir, because in most cases around the world it’s something that people are born into and not something that they earn. It hurts my heart every time a migrant worker calls me sir, because it means that they do not see me, and may not believe that I can see them. I chose not to leave my authentic self back in New York. I chose to bring my struggles and my family’s struggles, the dreams and the fears that I have with me to Doha. Perhaps if I could be Wesley the ideal traveler, I could forget that the word sir leaves such a bad taste in my mouth. After all, it is a word that denotes that someone is here to help bring you closer to the ideal moments that we chase when we travel -moments that are fueled by our own self indulgence. In the eyes of all of these workers I can see my grandfather, looking at men their same age and calling them sir. I almost want to run from the magnitude of it. I want to let them call me sir, and let the words roll off of me and onto the ground. But I cannot do it. The best part of me, the most authentic part of me, just won’t let me do that. Tipping is not expected in Doha but it’s appreciated, so the best me always tips. Many students don’t address the security guards when they see them but the best me always says hi, so that’s what I do. The best me is the authentic me. He is the person who understands that I am not special, and that under different conditions I could easily have been in a similar position as any of the migrant workers who call me sir. I was born in the best time in the best place to the best parents anyone could have asked for, so I rarely count my successes as my own. Doha has been so graciously kind to me. It has been so open and so authentic, and for the time I am here, it has brought out good things in me. As I stare out onto the skyscrapers towering over the water I think of the hands that built them and the dreams (many unrealized) that fueled those hands. And I am happy, that I don’t simply drown in the beauty of this place, and that I can still see them. The men attached to these calloused hands are not hidden from my view because they are the Doha skyline; they are the pickers of the tea leaves in my karak and the people who make the artificial dream of these few minutes possible. And I wonder in my heart, how I could ever become comfortable with any of these dream weavers calling me sir.